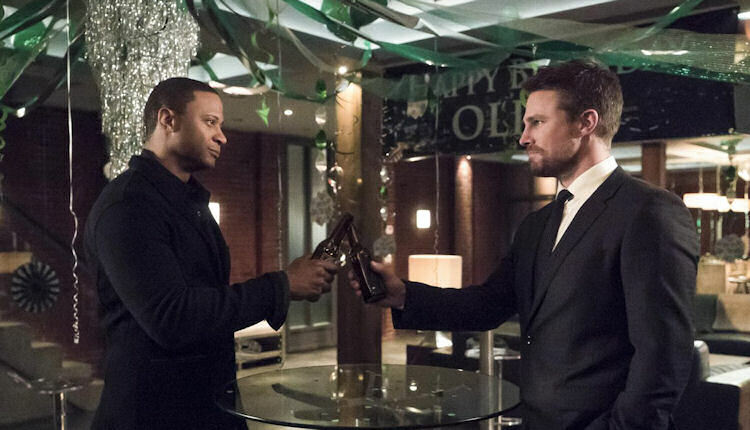 For a series with a habit of stalling its plot, it’s only fitting that the next-to-last episode of Arrow this season spent a lot of time on setup. The Arrow writers aren’t dummies, the payoff for all this maneuvering is sure to be explosive and they injected the episode with enough Olicity flirting to disguise the fact that they were moving the furniture around for an hour. That shoulder touch (and being locked in the Arrowcave) last week must have sparked some deep emotions in Oliver and Felicity, because suddenly they are back on the lovey-dovey train. With Chase seemingly neutralized, the team celebrates Ollie’s birthday with a surprise party. The whole group, except for Rene and New Canary, are there and after a toast, everybody slips into the next room so Olicity can flirt in peace. This relaunching of the ship feels a little sudden, but since a huge chunk of the fan base wants Olicity back, there’s not much room or reason to argue. The wheels start turning when Curtis is kidnapped at New Canary’s place while on the phone with Felicity. The crime scene has Talia al Ghul’s fingerprints all over it, which connects everything to Chase. Chase has a team of his own and it includes Talia, Black Siren and Artemis. Despite Ollie’s best efforts to hide those he cares about, they all get kidnapped (Thea trying to explain the multiverse to Lance was like trying to explain smart phones to senior citizens). The last straw is when Chase shows Ollie that he has William. The captive Team Arrow members are being taken to where it all began for Ollie – The Island. Ollie realizes he’s going to need some backup on this one. Malcom Merlyn breaks into the Arrow Cave because he wants to save Thea. Ollie also recruits Nyssa al Ghul and as a final piece, there’s the long anticipated return of Slade Wilson. The flashbacks with Kovar were just kind of thrown in there as an allegory of Oliver’s perpetual need to unlock himself from the cage of his own guilt. Nothing to see here. With so much badassery gathered in one place, next week’s season finale could very well be one of the best episodes in series history. The anticipation of what is to come overshadows the rather workmanlike effort from this episode.